Even after seeing that I do not have Bhakthi comparable to that of Kannappar, my Father has graciously blessed me also. Leaving the hunted boar under the guard of Kaadan, he went up the hill to see Kudumi Thevar, led by Naagan. 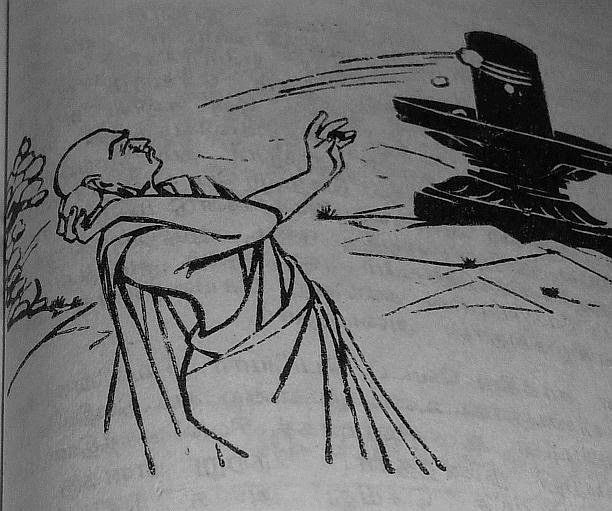 The instant he saw the holy Lingam, his heart melted for the Lord who was there all alone by Himself, with no person to serve Him and with no weapons to defend Himself against wild animals. Then he noticed some flowers and food strewn there and wondered who would have done this. Then Naagan explained to Thinnan that he had once seen in a hunting trip a Brahmin bathing him with water, putting the flowers murmuring something and placing the food there before leaving. Now Thinnan decided to stay there guarding Him and to look after Him as Naagan told, bringing water, flowers and food. His friends’ protest did not shake him. He told his friends to convey to his parents that he had decided to stay and look after Kudumi Thevar. They left him with his new-found concern for Kudumi Thevar. He plucked some wild flowers and decked himself with them. He chose choice pieces of meat of roasted boar after testing it through tasting. He then filled his mouth with water. Then he took all the three to Shiva Lingam uphill. He then poured the water from the mouth on the Lingam, adorned the Lingam with the flowers brought decked in his head and the meat which he had tested, before the Lingam and entreated the Lord to accept them, in his own way. Armed with his bow, he kept vigil there that night. The next morning he went for hunting to find food for the Lord. The priest came as usual and finding meat at the site, hurriedly cleaned it thinking that some wild animal had come and had its kill there or some hunter had desecrated that place. After cleaning, he bathed again in the river, and then with fresh water and flowers went on with his routine worship and left. Sometime after he left Thinnan came with water in the mouth, meat in hand and flowers on head. Cleaning the site of flowers the priest had used, he went on with his routine of spitting, adorning and offering and entreating, happy in his worship. The following morning when the priest saw the repeat of previous day he concluded somebody was desecrating the place and he made a prayer to Lord that this act of desecration be stopped. This routine of priest and Thinnan alternating their worship in their own way, each cleaning the others’ and the priest lamenting over his inability to prevent the act of “desecration” continued for six days. On the sixth day Lord appeared in the priest’s dream and told “What you consider desecration is an act of worship by my devotee who loves me dearly. Tomorrow you watch, hiding yourself from his sight, and see for yourself how deep is his devotion for me”. Next day the priest finished his routine and hid behind a big tree to watch what was going on. Thinnan came as usual, with meat in hand, water in mouth and flowers on head. When he approached the Lingam, he saw blood oozing from its right eye. He dropped everything on hand, went hither and thither in search of the miscreant who perpetrated this. Finding none, he collected some medicinal leaves and squeezed the juice on the bleeding eye but blood did not stop. As he was worrying about his inability to stop the bleeding, he remembered an old saying “Treat flesh with flesh”. He unhesitatingly plucked out his one eye using his arrow and pasted it on the bleeding eye and the bleeding stopped; maybe the first eye transplant operation. When the bleeding stopped, he danced in ecstasy that his treatment had worked and Kudumi Thevar was cured. But this happiness was only short-lived as blood started oozing from the left eye. This time he was not worried as he knew the cure and he had also one more eye to give. But then a doubt came to him that if both eyes were not there how could he know where to paste? Only for a moment he hesitated and then marking the spot on the Ligam by placing his foot there, he proceeded to pluck out his other eye. Then the Lord revealing His full form held his hand and said “Halt Kannappa, Halt” and Thinnan fell at Lord’s feet with awe and reverence. His plucked out eye was now restored and his name too changed to Kannappar. Both Kannappar and the priest, who was a witness to all this, were blessed with Moksha. The footwear repeatedly used on the road and worn-out becomes adornment to the Lord, water carried in the mouth and spouted becomes divine bathing, the remnants of a partly-eaten piece of meat becomes freshly prepared offering to the Lord and the tribal living in the forest becomes the crest-jewel of devotees of the Lord. Wonder of wonders! What is there that devotion to the Lord cannot do? Another Ananya Bhaktha of similar unconventional worship is Sakhya Nayanar, whose mode of worship is mentioned in Sivananda Lahari in verse 89 in the following words. Please tell me whether I should propitiate you by bow and pestle or by stones and I will do as you bid me. Saakkiya Nayanar, whose original name is not known, was deeply interested in truth and in his quest for truth went to Kanchi to study various religions. He was attracted to Buddhism and became a Buddhist monk. But after a time he got disenchanted with the atheist philosophy of Buddhism, and decided that through the worship of Lord Siva only he can attain the goal of liberation. He chose to worship Him as Lingam, the Rupa-Arupa manifestation of Lord Siva. But he did not change his religion or his attire of a Buddhist Monk. 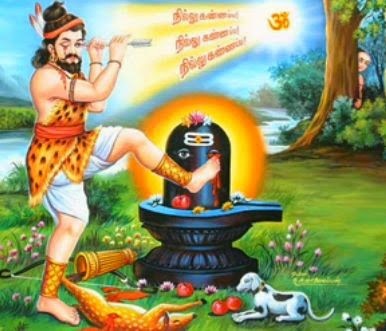 He became an ardent devotee of Lord Siva and he wanted to be initiated in the formal worship of the Lord as Lingam. He was looking for a Guru, when he spotted an elderly ascetic doing pooja of a Lingam in an open place. When he approached the ascetic for initiation, seeing his attire of a Buddhist Monk, the ascetic thought he was making fun of his pooja. So to chase him away he threw a stone at him. This act itself Saakiya Nayanar took as initiation and started throwing a stone daily at this Lingam as an act of worship with selfless devotion. Daily only after this ritual he will take food. Other times he had no thought other than that of the Lord. One day he forgot this ritual and remembered this at the time of taking food. Immediately he got up without taking food and fasted the whole day. Next day as first thing in the morning he went to that place and throwing a stone at the Lingam, he pleaded tearfully for forgiveness of the Lord for forgetting to offer worship to Him the previous day. His sincere supreme love for Lord moved the Lord, who appeared before Saakiya Nayanar and blessed him with Moksha. Both above cases show that with Ananya Bhaktha , it is not only the fruit, flower, leaf or even water that Lord gladly accepts, as stated by Him in Gita 9-26, but even the stone and the meat; for in Bhakthi, Bhava is more important than form. Faith and sincerity in the worship and unconditional boundless reverential Love for Lord in whom total trust is placed, and from whom nothing for oneself is sought are the important criterions that distinguish the Ananya Bhakthi from ordinary Bhakthi. And this Kannappa Nayanar and Saakiya Nayanar demonstrated in their unconventional worship of the Lord and were blessed with Lord’s vision and Liberation by the Lord.